Tonight I'm trying something a little different here on OnlyOneEyeOpen. I'm posting a photo with my usual blurb, and then, for the gearheads among my readers, a photo of the camera used to take the other photo. Now, I suppose I should by all rights also post a photo of the camera used to take a photo of the camera used to take the photo, but that gets kind of recursive pretty quickly and results in what we programmers call an "infinite loop". Now that we've gotten that out of the way, The Lone Oak. 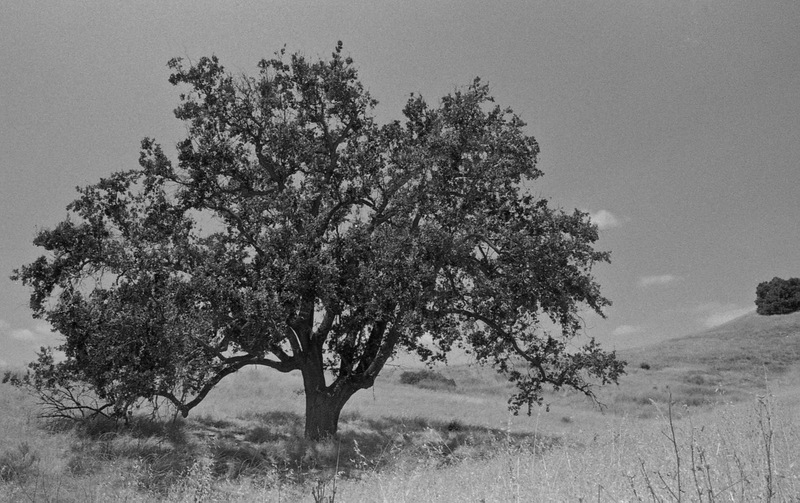 When I worked in Calabasas and lunched in Paramount Ranch or Malibu Creek State Park I was always on the lookout for a lone oak amongst the grasses. For some reason I find the image of a tree all by itself inspiring and appealing. I don't know if it is because I like being able to see the whole tree or if I like the idea that it grew there, all alone, and defiantly lives its life that way. Of course, trees aren't defiant and probably not only don't have a preference about where they grow, but don't have preferences of any kind at all. Anyway, there it is, a lone oak in the sun at noon. 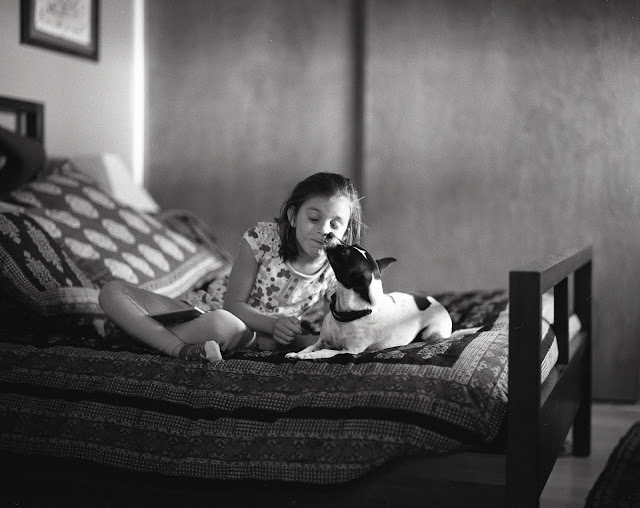 Ilford HP5 is one of my favorite films, but not for photos outdoors at noon. It really isn't ideal for that, since, as a fast film, one of its advantages is shooting in low light. Shooting 400 film in bright daylight is kinda dumb. Recently I've taken to carrying two bodies around, one with 400 and one with 100 film. That way I can shoot in the shadows or in the bright light and I get the best of both worlds. Ideally in this scenario I'd have shot Plus-x (recently discontinued by Kodak... sadness) or one of the Ilford 100 speed films. I have quite a pile of Arista 100 (which is supposedly Plus-x, so it might be hard to get in the future) which I usually keep loaded in one body or another. On this day, however, I had the FA with HP5, so that's what I used. 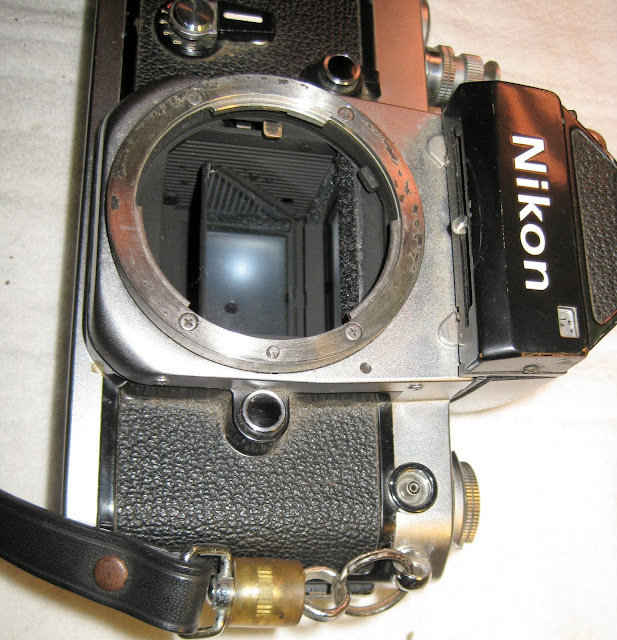 The Nikon FA. When I was just getting into the Nikons my friend Joel raved about this camera. Since I had F3s I figured, yeah, ok, a consumer grade Nikon... don't really want it. He kept it up, though, so I finally relented and got one, and I must say, not only was Joel right about it, but getting the FA has led me down the path to the FM, FE, FM2, FE2, FG and EM. In other words, the FA was a gateway drug to all the Nikon consumer grade bodies. Why? The thing is lightweight and takes great pictures. It also has every feature you could possibly want except auto rewind. It could auto wind since I also got the MD-15 with it but I don't usually use motor drives on manual wind cameras (except the EM). The wind mechanisms on these bodies are so nice and smooth that winders just don't seem appealing. Besides, I don't really need to shoot at 3 frames a second. More like 3 frames an hour. But when I'm going to be carrying a camera all over the place all day long the lighter bodies really start to look good. The F3 is one hell of a camera but it is relatively heavy. Nothing like an F4 which feels like carrying a brick on a strap, but heavier than this one. The FA offers manual shutter speed control, aperture priority (it picks a shutter speed based on the aperture you've selected), shutter priority mode (kind of the inverse of aperture priority, it picks an aperture for the selected shutter speed) and program mode (which picks aperture and shutter speed for the selected scene). It also had the world's first matrix metering, meaning that rather than meter in a circle around the center of the image like most cameras of the time it meters across the entire frame and selects an exposure time based on ALL of that information. This generally results in a more accurate exposure more of the time. All in all a nice camera. The lens in this photo is not the 28mm series E with which I took the Oak Tree photo. This is a 35mm f2. It is an extremely nice lens. I traded an Olympus OM4 for this lens. As it happens, that particular OM4 was bought as an 'as-is' camera from KEH for 19 bucks. Drop in 9 bucks worth of light seals and a couple hours work getting the wind timing back in sync with the shutter and you've got a very nice 35mm lens for not much money. I have a few all time favorite lenses, this is among the top 5. The 28mm series 8 is one stop slower and a bit wider and a whole lot lighter and smaller. I'll try to get a photo of it one of these days. So there you have it. One photo, one camera, a whole bunch of words. any new cameras? how many FAs do you have? if you say less than 4 i'll be disappointed. i like the oak tree shot but i think the contrast needs to be bumped up a little, give the picture some snap. have you tried framing out the stand of trees on the far right? hope all's still well at breakdown, hope the new challenges are stimulating. want to meet for a drink some sat. night? Hey! I've seen that camera somewhere. I'm glad you didn't get yourself into that recursion. That would've been time consuming. Sorry, Joel. Just one FA. Two FEs, three fms, one FE2 and an FM2, though. Is that OK? I'll try your suggestions. If I like them I'll post it again.